The U.S. 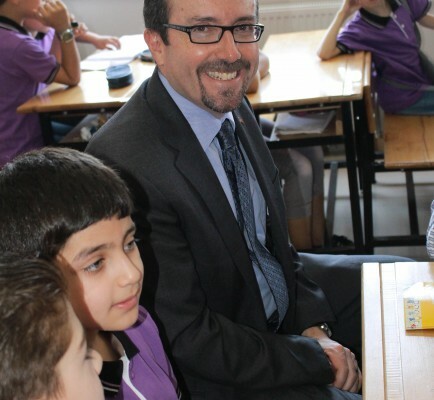 Ambassador to Turkey, Mr. John R. Bass, wrote about his June 26, 2015 visit to one of the ZF-sponsored schools for Syrian refugee children in Gaziantep. His blog post on the U.S. Department of State Official Blog, DIPNOTE, is being republished here with permission. Ramadan is a time for reflection and sacrifice. Additionally, it is a special time to fulfill the Islamic pillar of zakat, or charity. Across the world, Muslims — and many non-Muslims — exercise goodwill during the holy month and engage in charitable activities. Whenever there is suffering in the world, Americans open their hearts and wallets and are always ready to lend a helping hand. On June 26, my wife Holly and I had the opportunity to witness this generosity first-hand as we visited Cemil Karsli Ilkogretim Okulu, a school that opens its doors after hours for Syrian refugee children in Gaziantep, Turkey, and is funded by the Zakat Foundation of America. This U.S.-based, Muslim-run charitable organization works to address the immediate needs of the poorest people around the world and foster their self-reliance through zakat. Syria’s civil war has displaced millions of families over the last four years. Over four million people have been forced to flee the country, many of them taking refuge in neighboring countries. Turkey’s hospitality, in particular, is unparalleled. Turkey has opened its doors and welcomed 1.8 million Syrian refugees — more than any other country — and spent almost $6 billion to assist the refugees with their basic needs. Both the Turkish government and the Turkish people are to be commended for their warm generosity. Fortunately, Turkey is not alone in helping those Syrians fleeing violence. The United States is also providing more than $4 billion in humanitarian assistance throughout the region in response to the Syria Crisis, including $291 million for Syrian refugees within Turkey. As the Zakat Foundation shows, however, governments are not alone in providing assistance. The work of the Zakat Foundation is a beautiful example of the generosity that ordinary Americans have provided Syrian refugees. Before immigrating to the United States, the Zakat Foundation’s Executive Director Halil Demir grew up in an impoverished household in southeastern Turkey, an experience that has motivated him to help improve the lives of othersworldwide. In Turkey, the Zakat Foundation seeks to address the educational needs of Syrian children. It does so by supporting three separate schools, paying some teachers small stipends, and providing students with school supplies and uniforms. Last semester, 5,800 Syrian students benefited from the Zakat Foundation’s generosity. Looking to expand its impact, the Zakat Foundation recently signed a contract that will provide classroom space for a kindergarten and a university that initially plans to enroll 400 undergraduate students. As Ramadan reminds us all of the importance of caring for those less fortunate, I am reminded that generosity is the quality I most admire about Americans. Whether from the U.S. government, ordinary individuals, or inspiring organizations like the Zakat Foundation, American humanitarian assistance is playing a critical role in alleviating suffering around the world. As long as this crisis continues, the United States remains committed to working with Turkey and others to help our Syrian friends build the Syria that we all want to see: one at peace and inclusive of all communities. About the Author: John R. Bass serves as the U.S. Ambassador to Turkey. Please click here to view the original post on the U.S. Department of State Official Blog.